The light duty vehicle fleet of the future will likely be much more specialized than it is today. Three important vehicle classes are discussed under the assumption that we adopt smarter mechanisms than the car for most city travel. These include internal combustion engine powered highway vehicles, battery powered delivery vehicles, and driverless taxis which may feature a range of drivetrains. The potentially game-changing trends of car-free lifestyles and autonomous driving covered in Parts 1 and 2 of this article will strongly impact the composition of the future vehicle fleet. Perhaps the biggest difference that may be expected is a much higher fraction of specialized vehicles – primarily long-distance highway vehicles, delivery vehicles and driverless taxis. Let’s discuss these in greater detail. Many cars on the road today are expected to do a great deal of multitasking between city and highway driving. This will become increasingly unnecessary as car-free and driverless technologies remove the need for a city car. Highway traffic will be less affected, however, and may even increase if autonomous driving makes long car trips much more comfortable. It is therefore likely that a specialized new vehicle class emerges to cater to the consumer who meets all his/her city travel needs through telecommuting, SEVs, public transport (possibly driverless taxis) and delivery services, but still requires a car for longer-distance travelling. This vehicle class will cover by far the most miles of the three vehicle types discussed in this article and is therefore discussed first. For example, if city car travel demand halves and highway travel demand increases by 10%, highways will see more than double the miles of cities. The future specialized highway vehicle will probably be quite similar to the specialized long-haul trucks of today, only for transporting small numbers of people and light baggage. 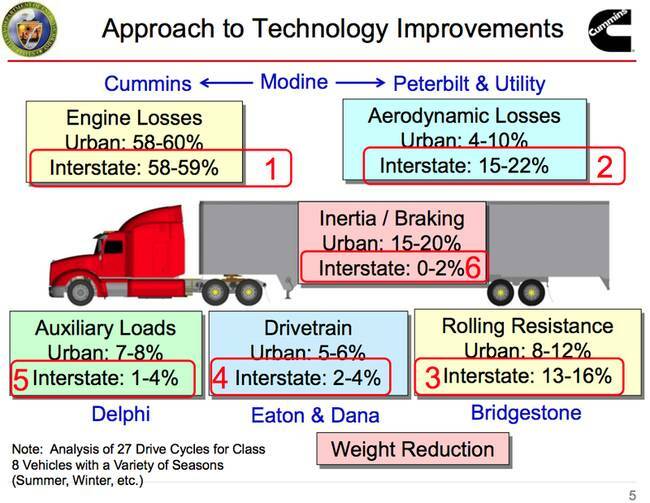 It will be powered by a relatively small diesel engine tuned to operate most efficiently at typical highway speeds and have a high emphasis on aerodynamics, since these are the most critical components of efficiency in highway travel (below). Some electronic assistance to maximize the amount of time spent at peak engine efficiency is also likely. There is no reason why future diesel engines cannot achieve 50% peak efficiency (the thermodynamic limit is around 65%). Toyota is already at 40% peak efficiency with their Prius gasoline engine and diesel engines can typically achieve about 20% greater efficiency due to higher achievable compression ratios. In comparison, peak efficiency in an electric car should be about 80% (product of ~95% efficiency for battery charging, discharging, motor controller, and the electric motor itself). In addition, a longer distance electric car will also be heavier due to the large battery pack, reducing its efficiency advantage. 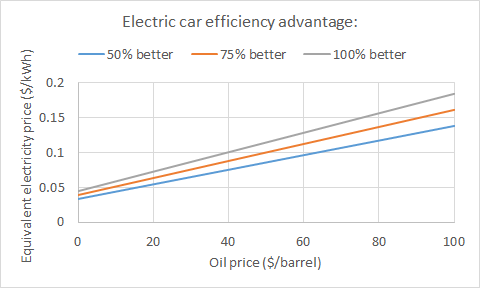 To quantify this comparison, the graph below shows the equivalent electricity price that would result in identical fuel costs to diesel at various oil prices and electric motor efficiency advantages. It is clear that electric cars will only have a significant advantage under oil price spikes and may even be more expensive to fuel under normal oil prices ($30-60/barrel). In addition, a diesel engine operated mostly under constant load can last for a very long time. For example, diesel generators typically run for about 25000 hours. At an average speed of 60 miles per hour, this equates to 1.5 million miles. A typical long-haul truck today can already reach a million miles before a major overhaul is needed. It is doubtful whether future battery packs will go a million miles while retaining sufficient range for long distance travel. As a result, the diesel long-distance vehicle may be cheaper to fuel in addition to having lower up-front costs, a longer lifetime, no range anxiety issues and no need for a vast supercharger network. It will therefore be the rational choice for this vehicle class. Ownership models will probably be split between private ownership for people who often drive long distances (or simply like to have a car tailored to their own tastes) and car rental services for people who occasionally need such a car. If the rental car can drive itself to the front door of the customer, it would certainly make the rental model a lot more attractive. As advanced telecommunications technology and SEVs increasingly remove the need for city driving, delivery services are likely to step up to completely remove the need for a city car. For example, people will do the weekly grocery shopping by a few clicks on their computers or taps on their smartphone as is already possible in some cities today. This is likely to be a major trend in coming years and many people want to try it (below). Similarly, delivery services for other easily standardized items such as electronics and basic appliances will also become more practical and economic as economies of scale ramp up. Advances in virtual reality technology can even extend the doorstep delivery model to less standardized items like clothing and furniture. 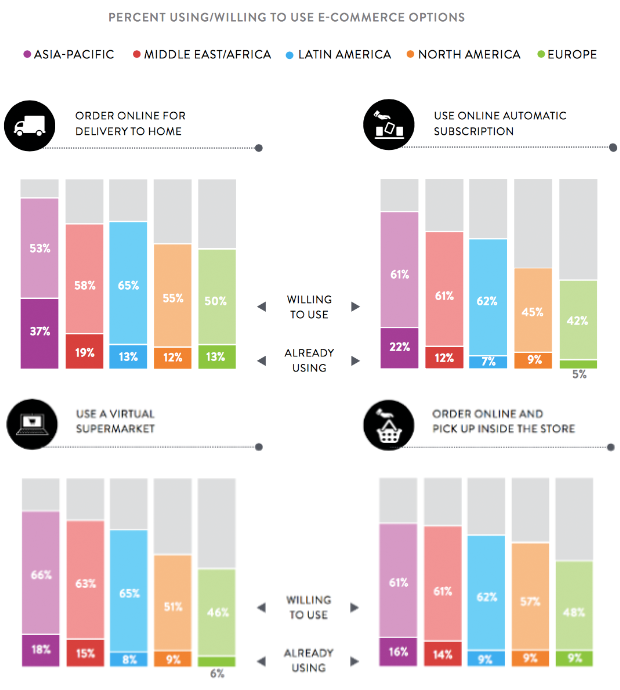 This trend will be greatly enhanced by increasing numbers of people working from home, enabling doorstep delivery services to operate efficiently through the whole day. This will make doorstep delivery not only much more convenient than driving into town, but also significantly cheaper. The short-distance delivery vehicles used for such services will have to negotiate stop-start city traffic with heavy loads, implying large inertial losses if regenerative braking is not implemented. They will also need to come to a complete stop for several minutes at regular intervals to unload cargo. Using an internal combustion engine for this purpose will result in low efficiency and a short engine lifetime and the electric motor will therefore be preferred. Charging will also be convenient since it can be done during loading. In addition, range requirements by most trips should not pose significant limitations. A certain percentage of these vehicles may be hybrids to cater for occasional longer trips, but battery electric drive is likely to dominate this segment. Many people feel that driverless taxis will be the dominant component of the future transportation system. 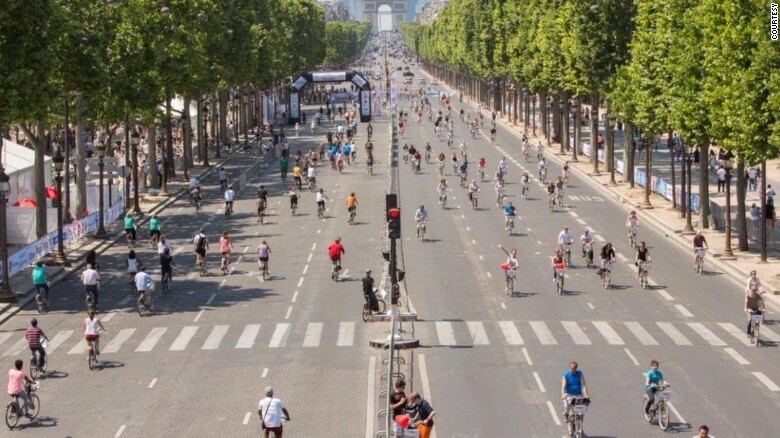 Yes, if the car-free technologies in Part 1 fail to live up to expectations and full autonomy is achieved, this may well be the case (in cities) even though there are real practical challenges that must be overcome. However, I think the large practical and economic benefits of telecommuting and SEVs combined with the attraction of low-traffic cities will prevail in the end (below). If full autonomy is achieved, my guess is that driverless taxis will consume 10-20% of light duty transportation energy – about the same as the short-distance delivery vehicles discussed above. The remainder of light duty transportation energy will be consumed by specialized highway vehicles (both privately owned and driverless rentals). Driverless taxis can still add substantial economic value though. It is not unrealistic to expect that driverless taxis will cut current taxi prices by about 75% – halving prices once by removing the need for a driver and another time by increasing the efficiency of operation. This would bring driverless taxi prices close to the level of private vehicle ownership costs today, greatly increasing demand from today’s levels. The efficiency of future driverless taxi services will depend significantly on the sophistication of autonomous driving technology, particularly the coordination of the entire fleet to ensure smooth traffic flow. For example, it is theoretically possible that autonomous vehicles can greatly increase the traffic efficiency at intersections by closely coordinating the movements of different vehicles as explained in this post. Basically, all vehicles should move in batches through the city in a coordinated manner so that only non-interfering batches arrive at a given intersection at any given time. In this way, no vehicle will need to stop or even slow down when coming to an intersection. This seems quite simple for any individual intersection, but implementing this in a large city with lots of intersections, a large number of vehicles, and lots of other variables like pedestrians and bicycles is likely to be very challenging. Continuously optimizing such a system containing thousands of cars, each with a unique destination which is frequently updated as new customers are picked up, will be very difficult to achieve in practice, especially given that there will be zero margin for error (e.g. high speed collisions at intersections). Hackers/viruses also pose a very real threat to such a centrally controlled vehicle fleet. The success of implementing such smooth traffic flow is likely to strongly influence the type of vehicle preferred in the role of driverless taxis. If autonomous vehicles are only aware of their immediate surroundings and traffic flow is much like it is today, battery electric vehicles should be preferred. The stop-start driving conditions would be handled most efficiently by the electric motor and limit the distance per day for the average car to 200-300 miles – which should be economically feasible without having to recharge. This will allow driverless electric taxis to charge primarily overnight, capitalizing on off-peak rates and avoiding the need to construct lots of superchargers in town. If traffic flow optimization is successfully implemented, however, the internal combustion engine will start to look quite attractive again. Cars with small engines (tuned for optimal efficiency and minimal emissions at city speeds) and low-cost mild hybridization will be highly efficient in such an environment. Cars will also easily do more than 400 miles per day, which may require uneconomically large battery packs in electric cars to avoid the need for rapid daytime charging. Even in the most efficient case, however, I expect telecommuting, SEVs and efficient doorstep delivery services to remove the majority of city driving demand we are used to today. In fact, as outlined in Part 2, I think it is likely that successful deployment of driverless taxis will further strengthen the case for carless value offerings, counter-intuitively reducing the total demand for driverless taxis. The discussion in this article assumes a significant departure from the current car-based lifestyle, especially within cities. This movement will be driven by economics, practicality, environmental concerns and the steady spread of car-free city zones. However, large numbers of cars will still be required and autonomous driving can significantly increase their value to society. In general, I expect these trends to favour the internal combustion engine over the battery driven electric motor. Two big benefits of the electric motor; high efficiency in stop-start traffic and limited compromise between performance and efficiency, will no longer count for much. Traffic flow will be much smoother (driven by factors such as the migration of the car from the city to the highway, coordinated autonomous driving, and reduced traffic volumes) and performance will no longer be valued (fully autonomous driving will strive to minimize g-forces). Finally, we should also mention fuel cell vehicles. It is still to early to call whether costs can be reduced sufficiently to make this technology a real competitor, but there may be another problem. While the internal combustion engine and battery electric car are clearly at their best on long, smooth trips and short, stop-start tips respectively, the fuel cell does OK at both (illustrated nicely in the figure above). In that sense, it would have been great in today’s light duty vehicle fleet of multitasking cars, but could be left out to dry in the future as the market becomes more specialized. Out of the three categories outlined above, fuel cells will probably do best as driverless taxis because these will do the most multitasking and it will be best to concentrate hydrogen infrastructure in large cities. In summary, I see a healthy mix of vehicles with both the internal combustion engine and the battery driven electric motor specializing in what it does best. Fuel cell and traffic flow optimization technologies are wildcards which could strongly impact the technology composition of driverless taxis in particular. The key assumption in this analysis is the success of the car-free lifestyle where city mobility needs are met via telecommuting, SEVs, public transport (e.g. driverless taxis) and doorstep delivery services. We’ll have to wait and see, but in my opinion, this clearly emerges as the most attractive personal mobility future.